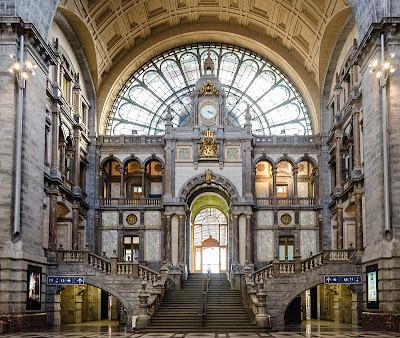 Amazing architectural detail in Antwerpen-Centraal Station. I think photographers tend to be slightly obsessive by nature, particularly when it comes to equipment. One regular debate revolves around the sharpness of lenses and photographers spend a fortune on a particular brand’s most expensive, best quality lenses. Is it worth it? The short answer is ‘yes – in a laboratory. But in real life there are a number of other factors to consider. What do you do if you can’t afford a full range of prime lenses; or if you travel a lot by air and need to travel light, or in environments where carrying a selection of heavy lenses is not practical? The answer is to get the best quality possible out of your lens. This applies of course whether you’re using kit lenses or prime lenses. A kit lens, when used at its sharpest aperture, can deliver excellent results that rival far more expensive lenses. The next logical question is what is the sharpest aperture for my lens? Most photographers will tell you between f5.6 and f11. The logic is that at wide apertures (eg f1.4-1.8) and very small apertures (eg f16-f22) you’re pushing the limits of your lens. At small apertures diffraction can seriously affect lens sharpness. Received wisdom is that F8 is often the sharpest aperture as it sits nicely in the middle. However the only real proof for the sharpness of your lens is to test it out for yourself. It could be f5.6, f7.1, f8 or f11. Ask yourself what the manufacturer envisages the lens being used for. If it is for portraits then wider apertures (eg f5.6) are more likely to be the sharpest and if it is a wide angle for landscapes then logically the smaller apertures (eg f11) would be the sharpest. But this is just a generalisation. The distance to your subject and focal length you use a zoom at will also affect which aperture is the sharpest. Take a photograph of a subject at your favourite working distance with your lens. Use a tripod, mirror lockup and a remote release to ensure that other factors such as mirror bounce do not affect your results. You’ll be amazed at the variation in sharpness that your lens produces at different focal lengths (if it is a zoom) and different apertures. Each lens has its sweet spots. Identifying them can help you get the most out of the quality your lens can produce. Now I mentioned photographers’ obsessiveness in the first paragraph. Returning to this point I feel bound to emphasize that making a great image has very little to do with picking the sharpest aperture on your lens. It’s all about emotion and how you interpret the moment. You may need minimal depth of field to isolate your subject or maximum depth to keep foreground and background as sharp as possible. It’s good to know where the ‘sweet spot’ is for your lens but you shouldn’t be a slave to any formulas. Just go out there and have fun and create. Few normal observers of your photographs are going to examine them obsessively for sharpness. What the image shows and how it communicates with the viewer is far more important. However if you are able to choose an aperture, then knowing the sweet spot of your lens and being able to benefit from that extra bit of sharpness could give your image an extra edge.